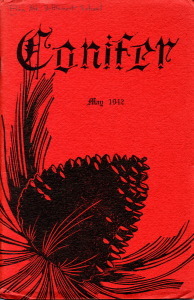 A publication of the Pine Mountain Settlement School during the boarding school years and briefly beyond, the Conifer was written by students and contained fiction, prose, and poetry. It was begun by Oradelle Malan, an instructor in English literature and writing at Pine Mountain from 1932 to 1935. The first issue was published in the 1930s and continued throughout the boarding school years until the School’s closing in 1949. It was then resurrected briefly in the 1960s. It overlaps the PINE CONE and in some cases is listed as a supplement to the publication. Subject LCSH Conifer, — 1939(?) – 1966(?). Description A publication of the school during the boarding school years. Written by students and containing fiction, prose, and poetry. Begun by Oradel Malan, instructor in English literature and writing at Pine Mountain, the first issue was published in 1941 and continued throughout the history of the boarding school until 1949. Citation Conifer. Pine Mountain Settlement School Archive, Pine Mountain, KY.
Conifer. Series 17: Publications. Pine Mountain Settlement School Archive, Pine Mountain, KY. Archival material.